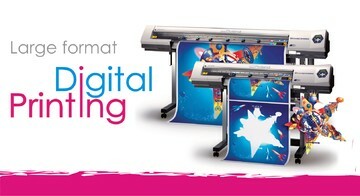 Digital printing refers to methods of printing from a digital-based image directly to a variety of media. 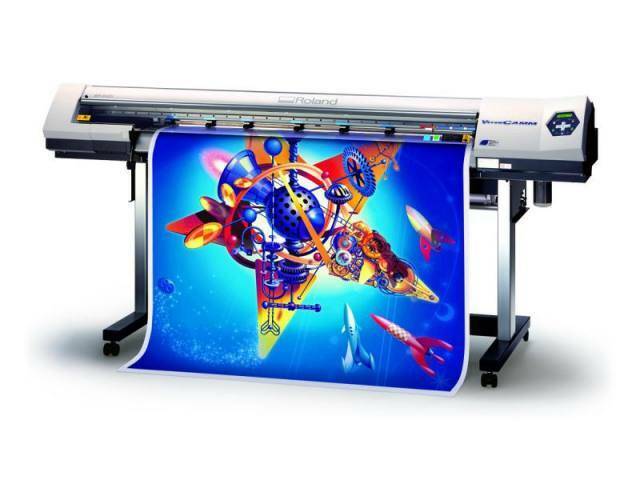 It usually refers to professional printing where small-run jobs from desktop publishing and other digital sources are printed using large-format and/or high-volume laser or inkjet printers. Digital printing has a higher cost per page than more traditional offset printing methods, but this price is usually offset by avoiding the cost of all the technical steps required to make printing plates. It also allows for on-demand printing, short turnaround time, and even a modification of the image (variable data) used for each impression. The savings in labor and the ever-increasing capability of digital presses means that digital printing is reaching the point where it can match or supersede offset printing technology’s ability to produce larger print runs of several thousand sheets at a low price. 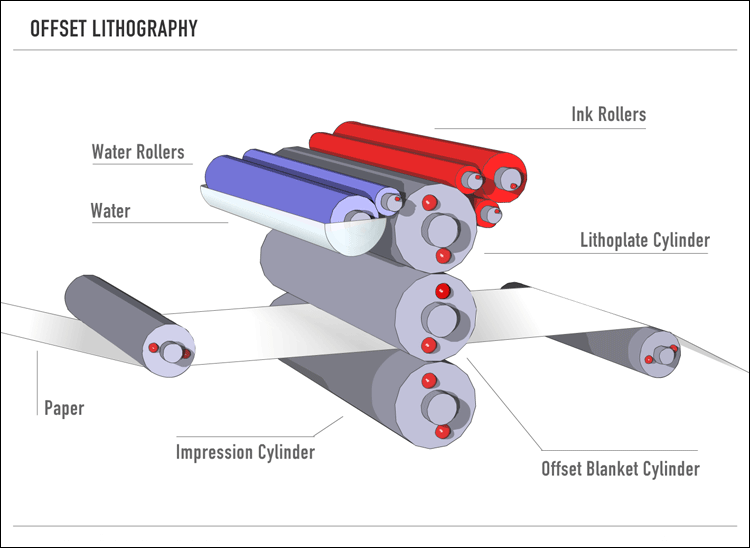 Offset printing is a commonly used printing technique in which the inked image is transferred (or “offset”) from a plate to a rubber blanket, then to the printing surface. When used in combination with the lithographic process, which is based on the repulsion of oil and water, the offset technique employs a flat (planographic) image carrier on which the image to be printed obtains ink from ink rollers, while the non-printing area attracts a water-based film (called “fountain solution”), keeping the non-printing areas ink-free. The modern “web” process feeds a large reel of paper through a large press machine in several parts, typically for several metres, which then prints continuously as the paper is fed through. Development of the offset press came in two versions: in 1875 by Robert Barclay of England for printing on tin, and in 1904 by Ira Washington Rubel of the United States for printing on paper. Screen printing is a printing technique whereby a mesh is used to transfer ink onto a substrate, except in areas made impermeable to the ink by a blockingstencil. A blade or squeegee is moved across the screen to fill the open mesh apertures with ink, and a reverse stroke then causes the screen to touch the substrate momentarily along a line of contact. This causes the ink to wet the substrate and be pulled out of the mesh apertures as the screen springs back after the blade has passed. The shop floor includes 21 specialty printing devices, giving us tremendous advantages in meeting the quickest turnaround times. 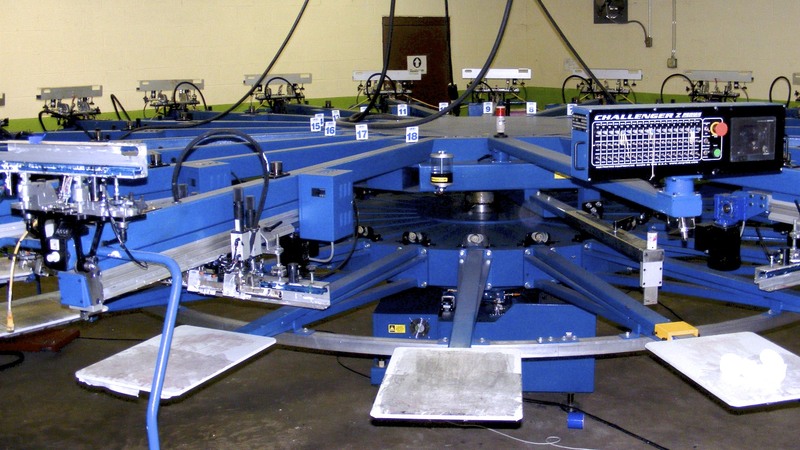 Three of our devices are 16 ft. wide, giving us the ability to print run quantities large enough for national rollouts. And at Primary Color, we never sacrifice quality for quantity, all 21 of our devices are color managed using the G7 method. The result is color matched print campaign materials across all print mediums and substrates. After all, color consistency is brand consistency. And isn’t the integrity of your brand the most important consideration of all? Embroidery is the handicraft of decorating fabric or other materials with needle and thread or yarn. Embroidery may also incorporate other materials such as, pearls, beads, quills, and sequins. Today, embroidery is most often seen on caps, hats, coats, blankets, dress shirts, denim, stockings, and golf shirts. Embroidery is available with a wide variety of thread or yarn color. The basic techniques or stitches on surviving examples of the earliest embroidery—chain stitch, buttonhole or blanket stitch, running stitch, satin stitch, cross stitch—remain the fundamental techniques of hand embroidery today. © 2017 Designed by Orange Web Group ,LLC . All Rights Reserved.